One of the little-known stories of the Napoleonic Wars is of a spy who went by the name of Francesco Toli. Like Angelo Pico, Toli appears to have been one of the Turin ‘Patriots’ – a young barrister who idealistically embraced their cause but was forced to flee during the crackdowns. Toli claimed to have procured himself an appointment with the French army’s staff where, because he was a native-speaking Italian, he was employed with spies, probably translating reports before going on missions himself.30 With his name first appearing around the time of the battle of Bassano (8 September 1796), Toli is credited with providing information that allowed Napoleon to get reserves to the battle of Rivoli (14 January 1797), affording him a complete victory. After securing a treaty with Austria in 1797, Napoleon went to Egypt in 1798. Before his return in 1799, an Austro-Russian army invaded Italy and pushed the French back to a small enclave around Genoa. During this reversal of fortunes, Toli switched sides. He threw himself at the mercy of the Austrian chief of staff, General Zach, who was at that time about to lay siege to the French garrison at the fortress of Cuneo. He agreed to take false orders into Cuneo, instructing the garrison commander to seek the best terms possible as there was no chance of relief. In fact the relief column was just a matter of days away – its guns could be heard in the distance as the Cuneo garrison marched off into captivity. When the Austrians learned that the recently returned Napoleon was going to attack Italy in the spring of 1800, Toli was employed by them in scouting out the strength and location of the French Army of the Reserve. Although Zach had guessed Napoleon would attack in May when the snow on the mountain passes cleared, he did not know the exact route Napoleon intended to follow, there being a number of major passes through which he could debouch. When it became increasingly likely that the French would use the Great St Bernard Pass, Toli was sent to explore the area. Unknown to him, on 14 May the French advance guard had already begun its advance up to the mountain pass. Toli – disguised as a priest heading for a monastery on the summit – was spotted and fired on by a French patrol. Finding the way ahead blocked, Toli took another route and, in what must have been an epic ordeal, took 60 hours to cross over the icebound peaks. Exhausted and injured, he climbed down the rocks towards the Etremont valley, before taking the path to Bagnes. At Mauvoisin he encountered a picket of 30 soldiers guarding the bridge, but was able to crawl past them unnoticed at daybreak. When in sight of the town of Osières, his luck ran out when a French cavalry patrol intercepted him. Toli pleaded to be taken before Napoleon. Napoleon looked down at a map. ‘How did you get here? The passes are guarded.’ ‘You well know, General, that I know my craft,’ Toli replied. He then explained his ordeal, upon which the First Consul congratulated him on his courage. ‘Do you want one thousand Francs a month to serve me? Serve me as faithfully as you did in 1796?’ Toli nodded. ‘Yes, you accept,’ exclaimed Napoleon triumphantly. ‘Then I will let you know the news.’ The First Consul explained the situation of the army and listened to Toli’s reports. He then asked Toli to find out the latest news from Melas’ headquarters and to meet him in Milan. I then wrote, from the mouth of the spy, the names of the Austrian corps, their force, their position, the names of their Generals, etc. The First Consul marked with pins, upon a map, all the disclosures made, relative to localities. The spy afterwards added Alessandria was not yet provisioned, and Melas was far from expecting a siege; that there were many wounded in the place and medicines wanting. Berthier, in return, received the authority to give him a note, pretty nearly correct on our position. Leaving Milan, Toli reported back to Zach, who realized that Napoleon was attempting to cut the Austrians off from their lines of communication with Vienna. In response he diverted two divisions from the siege of Genoa and sent them to help defend Piacenza. However, they were delayed in leaving and ran into a strong French force at the battle of Montebello on 10 June. After this the Austrians were forced back on Alessandria. Zach decided his last hope was to trick Napoleon by using Toli to deliver false news to the French headquarters indicating the Austrians were awaiting the arrival of more troops from Genoa before attempting a break out to the north across the River Po. Toli delivered this information to Napoleon on 13 June. The French commander compared the information with other intelligence and was not convinced. Napoleon had sent cavalry patrols north of the Austrian position and they had not reported any Austrian movement – if the Austrians were about to cross the Po they would have their cavalry patrols up there scouting the terrain. Perhaps Napoleon suspected that the Austrians had fed Toli false information? However, if the spy was to be believed, there would be Austrian troops to the south in the direction of Novi by the end of the day. He ordered General Desaix to take an infantry division south to intercept them; meanwhile the rest of the French army would probe forwards into the centre of the plain between Alessandria and Tortona. On 14 June, the Austrians attacked the French forward positions at Marengo. Napoleon was taken off guard by the ferocity of the Austrian attack and spent the day slowly retiring on his reserves. Fortunately for the French, Desaix’s division had been recalled from its false errand in time. In the evening Desaix launched a powerful counter-attack against the heavily depleted Austrian centre. By nightfall the French had reoccupied all the lost ground. Next day the Austrians agreed to an armistice, which confirmed Napoleon’s victory and opened the way for him to be crowned emperor four years later. The 1000 Louis were paid after the battle of Marengo, for the information had proved exact and important. The spy afterwards informed me that Melas, enchanted with his manner of serving the Austrians, had also handsomely rewarded him. ‘I am now,’ he added, ‘able to bid adieu to my villainous trade.’ This little event the First Consul regarding among the favours of his good fortune. After Marengo, both as First Consul of the Republic, then after December 1804 as Emperor of France, Napoleon needed to broaden his intelligence services considerably. In effect he used the same system he set up with Landrieux. Although on a much larger scale, the roll of the ‘secret part’ was much the same as before and entrusted to Savary, later the Duke of Rovigo. Matters of ‘high police’ on the other hand were left in the hands of the infamous Joseph Fouché, Duke of Otranto. General Anne Jean Marie René Savary (1774–1833) was born into a military family. During the Revolutionary Wars he was an aide to General Desaix and served on the Rhine, in Egypt and at Marengo. When Desaix was killed at Marengo, Napoleon took Savary into his service and was rewarded by unswerving loyalty. As one of Napoleon’s chief ‘fixers’ a black cloud lingers over Savary’s reputation. 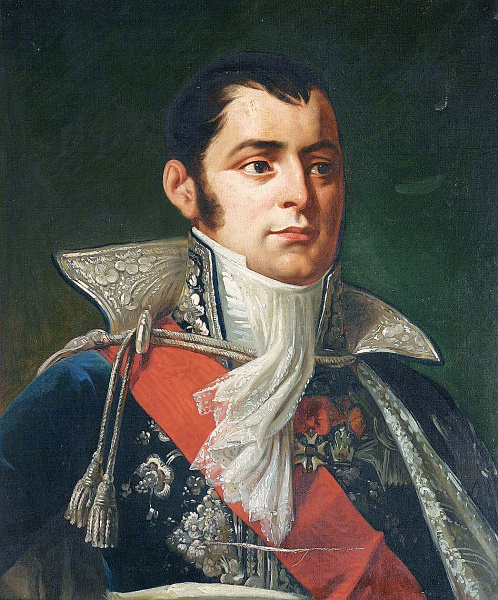 He played a leading role in several unsavoury affairs, including the illegal capture and execution of the Bourbon Duc d’Enghien in 1804 and the underhand acquisition of the Spanish throne at the conference of Bayonne in 1808. However, he was principally employed as head of intelligence in Napoleon’s Grand Headquarters and it was in that capacity that he ran one of the best-known spies in history – Karl Ludwig Schulmeister (1770–1853), known more simply as ‘Monsieur Charles’ by the French. The son of a pastor, Schulmeister spent most of the Revolutionary War supplementing his income as an ironmonger by smuggling. Living on the border of France and Germany, ample opportunities came his way to ferry contraband across the Rhine. Schulmeister proved an intelligent and ruthless gang leader, killing a customs officer who came to arrest him. Of course, his illegal activities on the German side of the river made him the perfect spy for French commanders. In 1794 he first teamed up with Savary, who was then serving in General Desaix’s advance guard division. In 1798 business was so good that he bought a house in Strasbourg, running a grocery store and tobacconist’s as a front for his operations. He also worked as an informer for Fouché at this time, monitoring French émigrés moving in and out of Switzerland. In 1805 Napoleon began planning to campaign in Germany for the first time. As his previous European campaigns had been limited to Italy, he needed to maximize his knowledge of the terrain and the enemy army ranged against him. In his capacity as head of intelligence, Savary went to Strasbourg and held what amounted to an open day for all the spies in French pay. Legend has it that Schulmeister turned up and so dazzled Savary that he was taken to meet Napoleon in Strasbourg on 1 October 1805. There are several popular stories about what happened next. According to one, Savary presented the spy, saying: ‘Here, Sire, is a man all brains and no heart.’ In another account, Bonaparte asked: ‘What are your references?’ ‘None, I recommend myself alone’ replied the spy confidently. ‘Then, I cannot employ you,’ retorted Napoleon tersely and withdrew behind a folding screen. Unperturbed, Schulmeister disguised himself and went before the Emperor a second time. ‘Who are you? What are you doing here?’ quizzed Napoleon. ‘I am Schulmeister.’ A suitably impressed emperor agreed to employ him. Although perhaps less colourful, the truth behind Schulmeister’s appointment probably had more to do with his role in the arrest of Duc d’Enghien. It is alleged that Savary co-opted Schulmeister into the operation and through him sent d’Enghien a forged letter purportedly from a young woman from Strasbourg he was attached to. This letter told d’Enghien she had been arrested and was being held in a house in Belfort near the frontier. When d’Enghien took the bait and went to rescue the girl, he would have to pass into French territory – and therein lay the trap. As a member of the deposed Bourbon monarchy, the duke would be liable to face the death penalty on his return to native soil. In fact the plan was superfluous, as the duke was simply kidnapped from neutral territory, tried without defence and shot at the Château de Vincennes. At the beginning of the 1805 campaign, Napoleon was faced with a coalition of Austrian and Russian field armies. While the Russians were still a month’s march away, an Austrian army under General Mack was located in the Bavarian city of Ulm. Wanting to defeat the Austrians before the Russians arrived, Napoleon developed a plan to encircle Mack at Ulm. It was imperative, therefore, that Mack remained where he was and was unaware of the French columns moving across his line of retreat. Achieving this deception would be the task given to Schulmeister. Posing as a noble of Hungarian descent, Schulmeister travelled to Vienna, claiming Napoleon had expelled him for his pro-Hapsburg views. In September he had in fact been expelled from the Department of the Lower Rhine by the local prefect, but it is unclear if this was related to his smuggling operations, or to provide him with an alibi with the Austrians. In any case, his next move was to ingratiate himself with Mack, which he did by presenting letters purportedly from Berthier’s staff. The French spy gained the total confidence of Captain Wend, the commander of the Austrian army’s intelligence services. Through conversation with Wend, Schulmeister was able to give Napoleon in-depth appraisals of Mack’s intentions. Dishing up lie after lie, Schulmeister deceived Mack entirely. His first concoction was that the French would march eastwards through the Black Forest and then advance along the Rhine towards the Danube. Having fixed Mack’s gaze in the wrong direction, Schulmeister further muddled his vision with false reports on the size of the French army. When Mack at last decided to advance out of Ulm on 11 October, he unexpectedly ran into French opposition in the guise of General Dupont’s division. Schulmeister quit Ulm and went to Stuttgart, from where he began sending Mack messages of the most urgent nature. He told Mack that Napoleon’s army was in retreat, claiming a revolution had broken out in Paris and that the English had landed an army in northern France – it was all lies. In short, despite all the better advice, Schulmeister convinced Mack that he should return to Ulm and await events. Like Zach in the Marengo campaign before him, Mack trusted the spy, complied and unwittingly allowed the French to complete their encirclement. On 20 October, with his army encircled, Mack capitulated in disgrace. His forces, including 33,000 men, 18 generals and 60 guns, defiled past a jubilant Napoleon. It was one of the greatest triumphs of deception in military history. The day after the surrender, Schulmeister returned to Savary looking for a new assignment. He told the intelligence chief that he had friends in Vienna, including an inspector of police and one employed on the Austrian war council. He also had planted an agent – a man named Bendel – with Archduke Ferdinand, who had escaped from Ulm and was now being hotly pursued. On 23 October Schulmeister set out from Ulm for the Austrian camp at Muldorf. Once there a friend of his named Lieutenant Rulzki introduced him to a number of Austrian generals and staff officers including Kienmayer, Werneck and Merveldt. Through his discussions with these men Schulmeister was able to advise Napoleon that the Russian commander, General Mikhail Kutusov (1745–1813), would not accept battle before he had concentrated all his corps. At this point Schulmeister’s luck finally ran out. Until then everyone in Austria had considered Mack the architect of disaster at Ulm, but people now began to suspect that Schulmeister – now prancing round in an Austrian uniform – may have had a hand in it. He was arrested and sent to Vienna, whereupon his famed good fortune returned. The French arrived in the city on 13 November just in the nick of time to save him from almost certain execution. To rub salt into Austrian wounds, Schulmeister was appointed commissioner general of police in the Austrian capital. He remained there until 12 January 1806, when he returned to Strasbourg, his previous expulsion order having been smoothed over by Savary. Having been paid by both Napoleon and Mack, Schulmeister’s earnings had been considerable. He treated himself to a fabulous château with ornamental gardens featuring a giant statue of Napoleon. In 1806 when Napoleon went to war against Prussia, Savary again employed Schulmeister. In a similar arrangement to Pico and Toli, Schulmeister – now known simply as Monsieur Charles – held the rank of captain and served on Savary’s staff. In addition to the usual intelligence operations, Schulmeister exhibited bravery in the field, capturing the town of Wismar at the head of just 13 troopers. The following year he gained a nasty scar when hit on the forehead by a musket ball at the battle of Friedland (14 June 1807). The former smuggler was then made responsible for the protection of Napoleon and Tsar Alexander at a conference in Erfurt held in 1808. A recurring theme for spies is their desire for recognition. Like a master criminal having pulled off the crime of the century, simply living peacefully in retirement on ill-gotten gains is never enough. Such people want the world to know of their brilliance, their cunning and audacity. Unfortunately in the case of spies, their ambitions are normally quashed by the ego of the general they serve. Successful generals want their victories to be attributed to their own brilliance, cunning and audacity and have almost always downplayed what was owed to ‘the secret part’. This is because of the reputation that spies have traditionally held in Western culture. They are abhorred – like Judas. Schulmeister was no different in this regard. Although a millionaire several times over, he coveted the cross of the Legion of Honour in recognition for his actions. Napoleon, however, was adamant that money was the only reward for a spy. After the end of the Napoleonic empire in 1815, Schulmeister and Savary were left unemployed and mistrusted. Loyal to the end, Savary wanted to follow his master into exile on Saint Helena. Refused, he took refuge in England, returning to France three years after Napoleon’s death in 1821. He eventually reconciled himself with the new regime and returned to military service, dying in 1833. Schulmeister was reduced to near poverty after the Austrians flattened his estate, apparently using an entire artillery regiment to destroy his mansion. He set himself up as a tobacconist in Strasbourg where he lived until death came in 1853. Although he had never received the Legion of Honour, he did enjoy one final moment of recognition. In 1850 Prince Louis Napoleon, nephew of the former emperor, paid Schulmeister an impromptu visit while visiting Strasbourg. None of his neighbours had any idea why. This entry was posted in Intell by MSW. Bookmark the permalink.